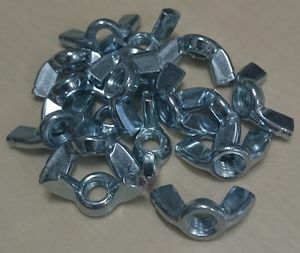 Nuts are internally threaded pieces matching a certain size of metric screw or threaded rod. They come in various shapes that all have their own uses and advantages. Hex nuts are probably the kind of nut that first comes to mind as they are among the simplest and most commonly used ones. They are rather cheap and we will soon have a couple of sizes in stock. The exact dimensions of these nuts are found in DIN 934 (may be useful for 3D printing matching holes, for example). If the holes come out a bit too tight anyway, try gently pushing the nuts in with a hot soldering iron. Hex nuts are also useful as "handles" for threaded rods: turning two of them against each other (DE: kontern) will provide you with a good hold without damaging the thread - as you most certainly would by gripping the rod directly with pliers. 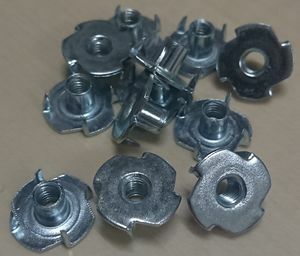 Nyloc nuts contain an elastic nylon ring that prevents the screw connection from loosening, but also make them harder to fasten. Wing nuts are easily turned without a wrench and are useful for on-and-off-again applications. Tongue-and-groove pliers are useful if you want to really tighten them. T-slot nuts are used to mount components on aluminum extrusions, for example. T-nuts (not to be confused with T-slot nuts) are nuts than can be hammered into wood to end up flush with the surface. The mounting hole always needs to be pre-drilled - for a flush fit, also counterbore it with an appropriately sized forstner bit! The sharp teeth on the edge prevent the nut from turning with the screw you're trying to put into it. Threaded insert can give you a metric thread in a piece of wood that is not very visible from the outside. The mounting hole always needs to be pre-drilled, then they can be screwed in with an appropriate screwdriver.